We are in the heart of the good season of IPOs, and it is looking a bit more promising than it started. Two weeks ago a retirement plan management service, Financial Engines (FNGN), priced above its range and shot up 44%. This improves on a prior financial-services play, QuinStreet (QNST), which priced below its range and sits only 10% above the issue price six weeks later. Last week a telecom technology firm, Calix (CALX), priced at the top of the range, went up about 15% on the first day, and has settled back 5% above issue price. A fabless chip company, MaxLinear (MXL), priced above the range and shot up 33%. 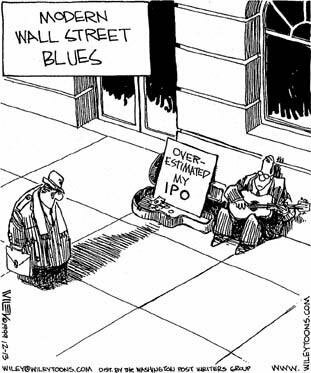 The IPO market is still tentative. Only four of the seven expected issues got out last week. Some of the laggards, like Redgate (RGM), are trying to roll forward and price day-to-day. It is selling bus advertising space in China, so it casts a bit of a damper on the China-is-a-field-of-dreams story. Looking forward to the heart of Silicon Valley VC dreams, Nexsan (NXSN), a data storage play, is expected to go out in early April. After that ReachLocal (RLOC) hopes to get out. Reach is a the leader in local online advertising, and will be a great indicator of the robustness of appetite for Internet ad-based IPOs. — Disclosure – I have an indirect VC interest on both of these.